The Sunday papers get their first bite of the Brexit cherry after Theresa May's last minute deal with the EU on Friday. But the positive tone seems to have slipped away for many. The Sunday Telegraph says a row has broken out between Downing Street and senior Eurosceptics. The paper reports that it is over claims the prime minister's aides told Michael Gove and Boris Johnson that the key British concession that finally clinched the deal with the EU on Friday was "meaningless" and "not binding". An unnamed senior source tells the paper No 10 had said a commitment to full alignment "doesn't mean anything in EU law". A separate source also said a specific cabinet minister had been told by aides that the provision was simply included to secure Ireland's approval. A Downing Street spokesman is quoted as saying: "We don't recognise this account of conversations." The Sunday Times reports that Mr Gove and Mr Johnson are to demand that Theresa May presses for a hard Brexit when the UK begins trade negotiations with Brussels as payback for their support for the Brussels deal. 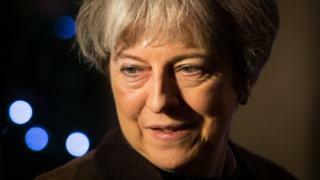 The Observer says Mrs May's hopes of securing a unique trade deal with the EU are at risk after Brussels said it was coming under international pressure to deny the UK special treatment. According to the paper, EU officials say a bespoke deal - more favourable to the UK than other non-EU members - would upset those countries. But it is not only Brexit that is causing cabinet rows. "PM had to separate ministers in bust-up at Commons", is the Mail on Sunday's headline. It says Mrs May had to step in after the Chancellor, Philip Hammond, and the Defence Secretary, Gavin Williamson, hurled abuse at each other as a simmering feud about defence cuts boiled over into a shouting match. The prime minister was standing feet away during a Commons vote - and the paper quotes a "well-placed source" as saying: "She made it clear the two of them should grow up and calm down. "After slugging it out toe to toe, they trudged off like naughty schoolboys." Mr Williamson is also the subject of stories about the famous pet spider he keeps in his ministerial office. The Sun reports that the tarantula has been removed from the building because an official has arachnophobia - a fear of spiders. It says the spider - which lives in a glass tank - will spend Christmas in Mr Williamson's constituency. However, the Sunday Mirror and the Sunday People put the creature's removal down to a ban on Ministry of Defence staff bringing pets to work. There is dismay in the sports pages at the latest off-the-field crisis for England's Ashes tour, after the reserve batsman, Ben Duckett, was suspended for pouring a drink over his team mate, James Anderson, in a bar in Perth. The Observer describes the incident as another self-inflicted blow that suggests a shambolic set of self-indulgent England cricketers drowning themselves in alcohol. The Sunday Mirror says England need to realise they are not on a stag weekend and the Sunday Telegraph says the stupid behaviour of a selfish few not only betrays their colleagues, but also shames the England shirt. Finally, the Sunday Times reports that numerous companies in the US are cutting down on alcohol or removing it from their office Christmas parties altogether following two months of sexual assault revelations. It says so many sexual harassment scandals have involved allegations of work-related misconduct that HR departments are looking to reduce or eliminate their liabilities. The vice president of a Chicago-based consultancy tells the paper: "Employers are very wary of creating an environment where inappropriate contact between employees could occur."